Ceiba del Mar is a luxury boutique hotel at the edge of Puerto Morelos in the Riviera Maya Mexico. Only 20 min. 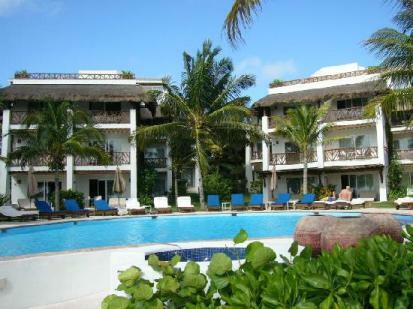 from Cancun lies this charming boutique hotel with 45 rooms and suites! This hotel is directly on the beach in an area that is not developed yet. There are no other high rise hotels nearby. The beach is sugary white and smooth. The beach is full of wooded beach chairs with a 2" cushion and plenty of palapas. There is some seaweed on the beach but hotel staff clean it each day. 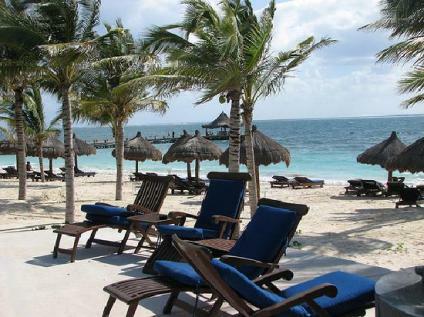 The staff will even go the extra mile and set up your beach chair for you and make sure you are more than satisfied. 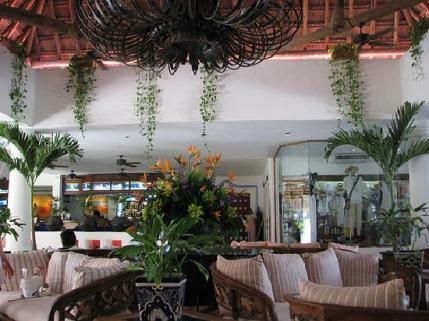 This is a picture of the lobby at Ceiba del Mar. What is unique about this boutique hotel? 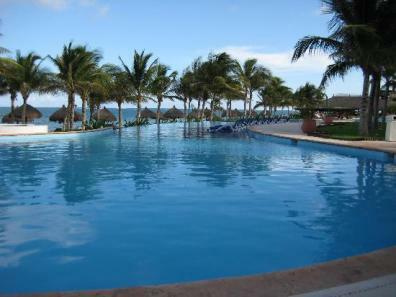 2 swimming pools with swim up bar surrounded by sunbeds and shade areas will quench your need for the sun! The staff is incredibly welcoming and everyone is friendly! The grounds are gorgeous and well maintained. aquafit, fitness room, tennis and bikes. Kids are welcome at this resort, however there is not much for them to do. So keep this in mind. This hotel has a luxury gourmet plan that includes all your a la carte meals, snacks and beverages at their 2 restaurants. If your relaxing by the beach or pool and get hungry, your beach attendent will be available to bring drinks and food to you. Restaurants close each night around 11pm. The rooms at Ceiba del Mar are spectacular! 36 Master suites have a separate bedroom and living areas. Rooms are very large and clean with lots of storage space! Almost every room has an ocean view. The beds at Ceiba del Mar are very soft with lots of pillows! This aromatherapy spa uses all natural and organic products. Many treatments are available as well as couples massages. This picture is of one of the rooms at this Riviera Maya hotel.